At 16 years of age I was involved in an All-Terrain-Vehicle (ATV) accident while out in the woods with some friends. I was lucky that a neighbor was able to bring me to a hospital, because I couldn’t move my right arm at the shoulder, at all. I was pretty scared. After an examination by the Emergency Room doctor, I was told that I needed surgery to repair the “growth plate” in my right arm. My mother was managing a chiropractic office at the time and fortunately there was a young sports chiropractor working there. When my mother told him about what had happened, he advised her to bring me in for an examination before they performed surgery. Luckily, my growth plate was fine. So, with several months of chiropractic care and rehabilitation, my shoulder became absolutely perfect. 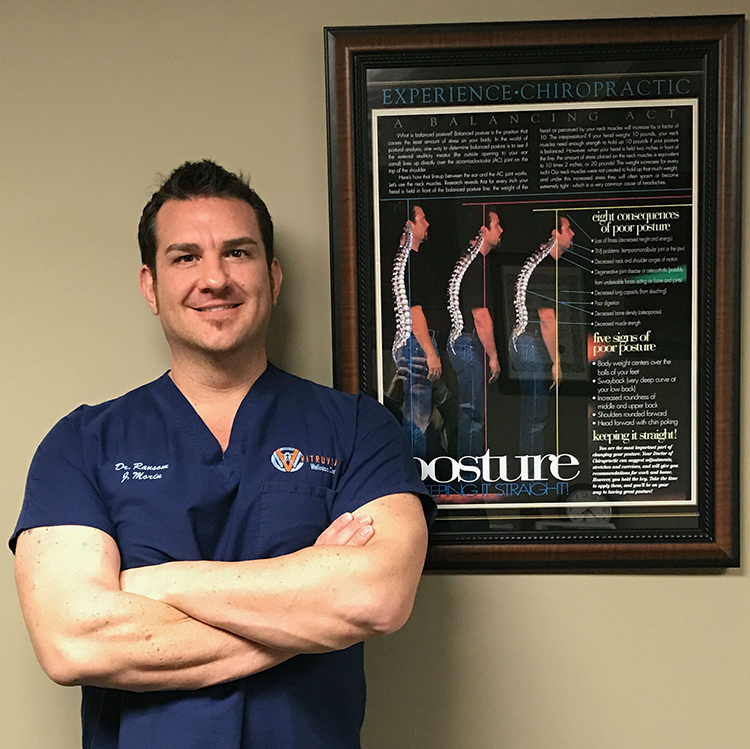 My decision was made: I knew I would become a chiropractor to help save people from having unnecessary procedures. Years later, after graduating from chiropractic college, I watched my father as he suffered from a severe case of rheumatoid arthritis. I decided to learn as much as I could about alternative therapies for the treatment of chronic disease that weren’t managed or slowed by traditional medicine. “Functional medicine” was the missing key to practice for me. There are many ways to help the body heal. My goal is to educate, everyone and anyone, who want to live the healthiest life possible. Dr. Ransom J. Morin is a board-certified chiropractic physician who has practiced in both the United States and in Italy. After graduation from Life University Chiropractic College, in Marietta, Georgia, he was licensed to practice in February, 2004. He worked locally until love of travel and adventure led him to apply for work with a hospital-based company, Gruppo Giomi, in Reggio Calabria, Italy. He practiced there from 2007 to 2009. In June of 2009, Dr. Morin returned home to West Springfield, Massachusetts, to serve his local community by creating the Vitruvian Wellness Center. Whether patients are 2 weeks old or 86 years old, Dr. Morin has a natural gift for making all his patients feel safe and comfortable during their visit. A wide variety of patients are seen in the office for different conditions. Children come with ear infections and bed-wetting issues; senior citizens have aches and pains; bodybuilders want to maintain their bodies after years of heavy lifting. From professional highland game competitors, to strong men and power-lifters, all choose Dr. Morin for his experience with athletes. Dr. Morin also works with local police officers, fire fighters, military personnel, and veterans. He is truly grateful for the service to our community that these men and women provide. Dr. Morin primarily uses the Gonstead technique, but is also proficient in full spine, cox flexion/distraction and extremity adjusting. He is committed to continuing his education. Ongoing training includes attendance at Functional Medicine University and post-graduate seminars. These address topics relating to chiropractic care, including extremity adjusting, neurology, nutrition, cardiology, and patient rehabilitation. Dr. Morin proves he is a leader in health and wellness by practicing what he preaches. He works out four to five days a week with weights and also trains once a week in Mixed Martial Arts. Outside of the gym, he enjoys reading, woodworking and making educational patient videos. The Vitruvian Wellness Center sponsors an annual car wash to raise money and gather food items for the Parish Cupboard, which helps feed homeless and local families in our community in their time of need. Every year for the past four years, we have helped provide Christmas gifts to foster children that are part of the Devereux Care Facility. One of our favorite causes is supporting Rachel’s Table. Dr. Morin believes everyone should be able to have healthy meals on a daily basis, and it’s his passion to help feed the less fortunate. In 2012, he learned of the Masons and of the amazing services that they provide to local communities where they are located. In 2013, he joined his local Mason lodge in order to contribute to the community on a larger scale. He considers his Mason brothers an amazingly loving and giving group of gentlemen. He is honored to have been inducted into this fraternity.